Are you looking for an Oahu bail bonds service? If so, the team at Wanna Get Out Bail Bonds is here to help! We pride ourselves on being the dependable, affordable solution to your situation. That’s why no matter the time of day or night–that’s right, we offer 24-hour bail bonds–you can count on us to be there for you in your time of need. We know that emergencies don’t happen on a schedule and that’s why we will go above and beyond to ensure that you have someone who can lend a helping hand. Whether you’re the person calling a family member in the middle of the night to ask for help or you’re the loved one who gets that phone call, we know that you’re right in the middle of a stressful situation. To make matters worse, it can be incredibly hard to know what the right thing to do is. The person who has been arrested no doubt wants to get out of jail as quickly as possible, and this makes complete sense. After all, it’s much easier to consider your next steps from the comfort of your own home. Getting out of jail fast ensures that not only do you not have to spend any unnecessary time behind bars, but also that you can get back to your daily routine. The good news is that at WGOBB, that’s exactly what we do! Whether you found us because you searched “bail bonds near me” or you have heard good things about us from reading some of our reviews, we’re glad that you found us. We strive to be your source for Oahu bail bonds. With plenty of satisfied clients and years of experience under our belts we are the team to turn to in your time of need. But what makes us different from the others? We’re glad you asked! As we mentioned above, we offer 24-hour bail bonds which means that you’ll never be left high and dry. Our phones are on 24/7 because we know that a call could come in at any moment and that the person on the other end might need our help. Having been in the business for as long as we have, we’ve pretty much seen it all. We know how crazy situations can get, but we’re glad to offer free bond advice to ensure that our clients are making the best decisions for themselves. Knowing what we know about how bonds work and how the justice system works, we put ourselves in your shoes and ask ourselves what we’d do. This makes us uniquely qualified to offer advice and we’d be glad to offer our suggestions for your specific situation in order to help make your life a little bit easier. 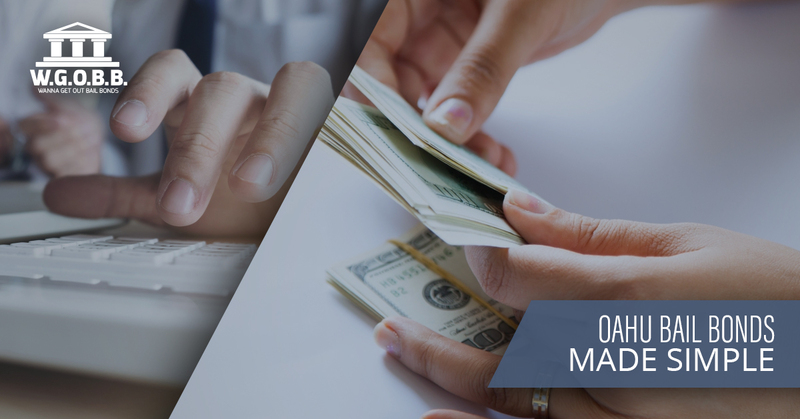 One of the things that separates us from other bail bond companies in Hawaii is the fact that we proudly offer flexible payment plans to suit your needs. 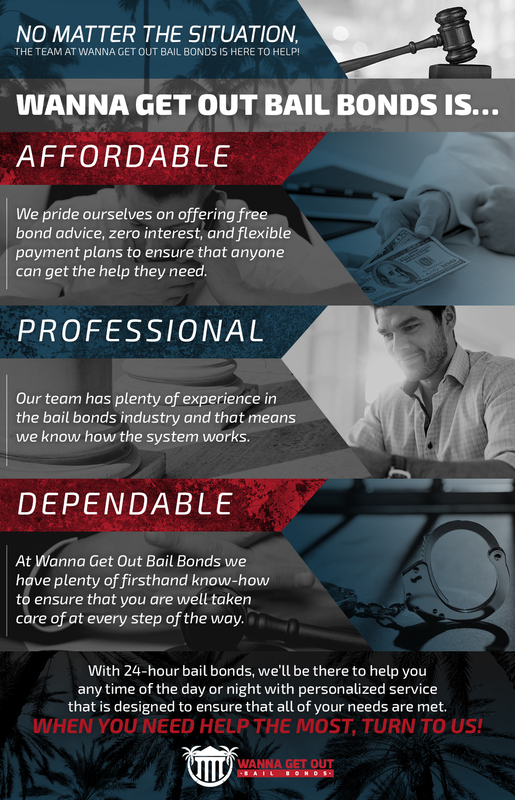 Every situation is different, but at Wanna Get Out Bail Bonds we’ll take a look at the facts to see what we can do for you to help you come out the other side unscathed. In addition to being flexible with payments, we also accept collect calls and zero interest. We even offer up to a 20% discount for paid in full! It doesn’t get much better than that. And did we mention the fact that we don’t require collateral for most bonds? That means that working with us just makes sense. Our goal is to make the process as easy and stress-free as possible on our clients. If you’re on Oahu bail bonds services can feel like they’re hard to come by. How can you know which company to put your trust in? At Wanna Get Out Bail Bonds, we treat you like family. We pride ourselves on offering our clients the best solutions and the best customer service in the industry. When we say that we treat clients like family that’s exactly what we mean. We know the value of having someone you can trust who is there for you in your time of need. As we mentioned above, we’ve seen it all. That means that we’ll assure total discretion for your situation while helping you to figure out what’s next. Whether you have a strong support system to turn to or you’ll be relying on us to help you along the path, we’re the bond agency you can count on to be there for you. It’s as simple as that! Wondering what others are saying about Wanna Get Out Bail Bonds? Take a look at our Google reviews and you’ll see that we don’t mind going above and beyond for our clients. As you may have noticed, we take our jobs seriously and we consider ourselves to be a team that people can turn to whether they’re looking for advice or they’re ready to post bail. We proudly serve the entire island of Oahu (Wanna Get Out Bail Bond is located in Honolulu) and we’ll be here to help no matter the situation that you find yourself in. Have questions about the process? We understand that it can be confusing! Feel free to check out our list of frequently asked questions about bail bonds to get a general idea if you’re so inclined, or don’t hesitate to contact us today if you’d prefer to speak with us. Either way, you can count on us to be there for you in your time of need. No matter the time of day or night, no matter the situation, no matter the jail. At WGOBB we’ll provide you with the expert service you need, and we’ll do it with complete and total discretion. When you need help the most, look no further. Our Oahu bail bonds company will make your emergency our top priority, so contact us today to get the help you need!